The Sony Xperia T2 Ultra comes with Android 4.3 out of the box, while the company has promised the Android 4.4 KitKat update is already in the works. The software package looks very much the same whatever the Android version though and that's why everything feels and seems so familiar. Unfortunately, running the same software as the other Xperia phones means there are no UI optimizations to account for the big screen. The only feature that helps one-handed use is the double-tap on the Home key to slide down the notification area. Samsung and Huawei area already offering well-thought-out single-hand modes, but it seems Sony isn't keen on delivering such just yet. The lockscreen is the usual affair - it supports widgets (one per pane), while the rightmost pane will fire up the camera. There are a few available default widgets, but you can always get more from the Play Store. The Xperia T2 Ultra lets you add or remove homescreen panes (you start with five) and set any of them as default. You can't have more than seven panes at any given time though, nor can you change the order they're in. Adding stuff on the homescreen is easy, as it is the customization. You can set various live and static wallpapers, add widgets and shortcut, or change the UI theme. The notification area features a few toggles (Sound, Bluetooth, Wi-Fi and Brightness by default). There's also a quick shortcut to the settings menu. The toggles are customizable and you can choose between 16 different quick toggles and have up to 10 of them visible in the notification area across two rows of shortcuts. You can even opt out of having the Settings key, which is nice. 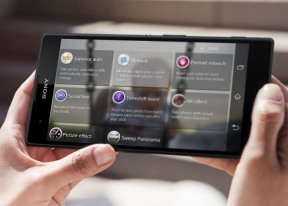 The Xperia T2 Ultra uses the stock Android task manager that lets you switch between recently opened apps, as well as terminate them with a side-swipe. The so-called "small apps" are also available in the T2 Ultra and are accessible via the task manager. They are similar to Samsung's Mini Apps, and pop up tiny widget-like applications on your homescreen, which you can move around and use without having to open the full-fledged app. So far, there's a default set of nine: Active Clip, Chrome Bookmarks, Browser, Calculator, Calendar, Gmail, Timer, Notes, and Voice Recorder. You can launch only one instance of a Small App, but you can open multiple Small Apps simultaneously. The user interface is buttery smooth, there is no visible lag or long loading times. The Sony launcher is lightweight and, combined with the snappy chipset, you'll get great UI experience. The upcoming Android 4.4 KitKat and its optimizations might even make things even faster.